On September 11, 2001, I had actually woken up early (for me, at that time, pre-Phoebe). I had gotten up at 8 am so I could go with Sari to vote in the N.Y. primary election being held that day. (The election was later cancelled and rescheduled.) Then Sari went off on the subway to work at her job near Madison Square Park in Manhattan, where her train unknowingly passed under the World Trade Center right as the first plane hit the North Tower. By the time Sari made it to work, the second tower had also been hit. I called her at work to relay the news, and the South tower fell as we were talking, which cut us off. Though I was able to reconnect with Sari a short time later, I spent much of the morning freaking out, watching the second tower fall from the roof of my building, and meeting up in Park Slope with my good buddy Dean Haspiel. It was all too stunning, surreal, and horrific to truly understand. Sari left work shortly after the second tower fell and watched TV, and the smoking craters, from the balcony of her sister-in-law’s house. She finally decided to walk home over the Manhattan Bridge, where I met her later in the afternoon. 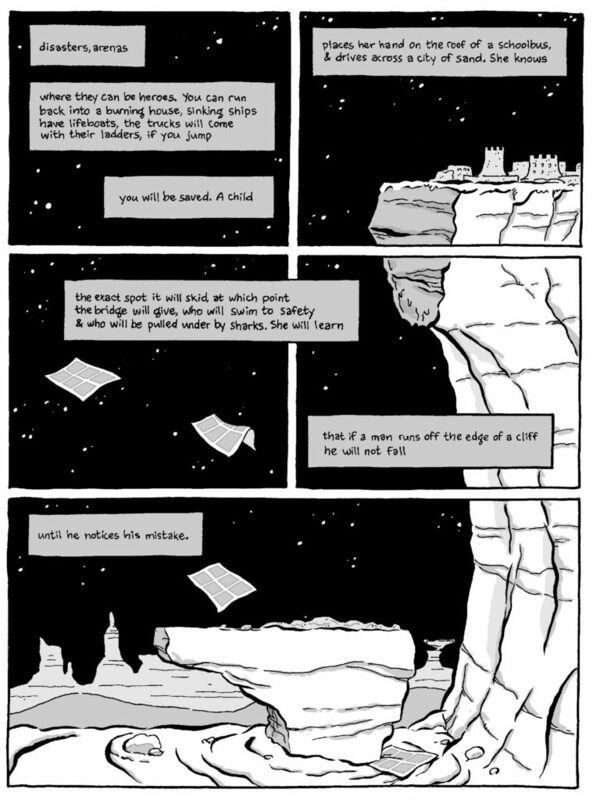 I tell the rest of the story in my three-page comic “Song for September 11,” which you can read on ACT-I-VATE. Shortly after 9/11, Alternative Comics publisher Jeff Mason suggested doing a benefit anthology for the Red Cross, and I was invited to contribute. I wrote and drew the piece in November 2001 and it was published in the anthology 9/11: Emergency Relief in January 2002. You can read a little background about the piece on Comic Book Resources. The Library of Congress asked me for the original art for “Song for September 11;” the pages are now in their archives in Washington, D.C. In 2006, on the 5th anniversary of 9/11, I did another 9/11-related piece, the one-page “Post-Traumatic Skyscraper Anxiety,” which you can also read on ACT-I-VATE. The piece was recently published in print in Cousin Corrinne’s Reminder #3. There’s a video of me reading the piece here. In many ways the experience of 9/11 led me to volunteering for the Red Cross after Hurricane Katrina. Both catastrophes led me to make art. 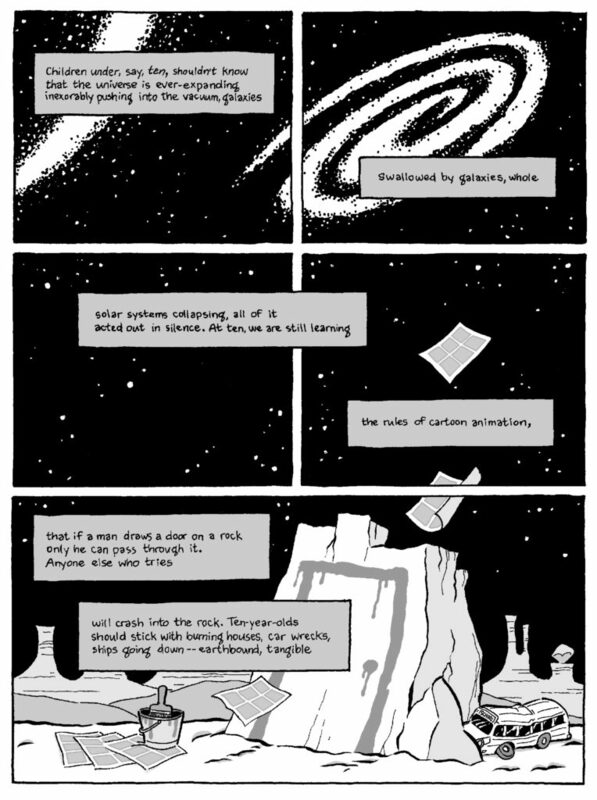 I muse on the connection in the paper, “Filtering Catastrophe Through Comics,” which I wrote for a panel I was on earlier this year. As I listen to the roll-call of names of those lost on September 11 at the World Trade Center, I devoutly hope to never witness such tragedy again. Wednesday, Feb. 2: Walls & Bridges' "Catastrophe Practice"
This Wednesday evening I’ll be taking part in a round-table discussion at the New School on the political, social, individual, and literary imagination of catastrophe. Titled "Catastrophe Practice," the panel is part of the Walls & Bridges series, co-sponsored by the French cultural institute Villa Gillet and n+1 Magazine. Other participants will be French thinker Jean-Pierre Dupuy, American philosopher Jonathan Lear, French geographer Michel Lussault, and moderator Marco Roth. To quote from the program description: "Catastrophes are the nightmare flip-side to the record of human progress and achievement. The idea of disaster haunts how we think about our lives on every level, from global planning to individual relationships. Could planning more for catastrophes help eliminate/neutralize them, or do already we give them more attention than appropriate? Will we, no matter our precautions, forever be victims of the vagaries of nature and existence in all its complexity? If so, how may we learn to live and think with and within the expectation of catastrophe?" Pretty heady stuff — let’s hope I can keep up! I’ll discuss both 9/11 and Hurricane Katrina, and will present a 10-minute slideshow of images to accompany my remarks. Sari and I caught a showing of War of the Worlds on Sat. nite and we were unexpectedly overwhelmed. I had read a pan of the flick from Ebert, and a qualified “thumbs-up” from A.O. Scott of the Times, so my expectations were fairly low. But being a fairly dedicated fan of both Spielberg and Cruise, I figured it would at least be an exciting and fun way to take in two hours of movie theater air-conditioning. Instead, I found myself having a profound emotional experience. As a native New Yorker who was in the city on September 11, 2001, I’ve long struggled with coming to grips with that day. It was truly such a shocking, unbelievable event that in many ways I feel like I never processed it. For me, the movie was actually cathartic, in the truest sense of the word. That terms get thrown around rather loosely, but in this case I think it actually applies. Yes, on Sept. 11 our city was attacked — but neither I nor Sari were ever in personal danger. Yes, the Twin Towers were destroyed — but I had only visited them once, when I was a kid. Yes, thousands of people died — but I didn’t know any of them. And as much as I wanted to do something to help in the aftermath, there really was no opportunity (other than helping to gather and sort donations, which I did, and contribute a story to one of the 9/11 benefit books, which I also did). Nevertheless, for many months after Sept. 11, I awoke in a panic imagining more planes were coming, this time for me; or I nearly jumped out of my chair any time a truck back-fired or an ambulance sped by. But then eventually, those feelings deadened as I got back the business of living my own little life. So settling in to see a movie of sci-fi escapism, I was shocked to see how much the movie paralleled September 11, right down to its New York-area location (in fact, some scenes were shot in nearby Park Slope). The scenes of Tom Cruise running in pure terror as the aliens begin zapping — vaporizing — everyone around him, buildings crashing around him, was right out of the Towers falling. And when he scrambles back to his apartment to find his hair and clothes covered in ash — most of it the remains of his fellow human beings — that was truly chilling. And watching this all happen, I was as terrified as any of the film’s characters. For real moments during the movie, I actually forgot I was a viewer and that it wasn’t real. I won’t spoil the film for those of you who haven’t read the book or seen the film yet, but there’s one more point to make. In a departure from typical summer blockbusting, this film does not feature a “hero” as its central character. Besides being a failed husband and father, Tom Cruise’s character is basically just a “regular guy.” He doesn’t end up leading the rebellion to repel the invaders. He doesn’t discover their secret weakness. He doesn’t pilot an F-14 into the mother ship and destroy its central command. For the most part, he’s just a working class guy caught up in protecting his family, trying to survive. I think this was a brilliant decision by Spielberg and I can’t help but imagine that he was thinking of not only Sept. 11 but Schindler’s List when he put this film together. It was important for him to show helplessness, to have us truly comprehend that sometimes we can’t control our destiny, that the heroic individual doesn’t buck all odds and triumph. This is an important lesson — it teaches us empathy. Sari and I came out of the film in some sort of shock. We hadn’t been prepared to feel that strongly — that’s why the film was so cathartic. Yes, it was a silly sci-fi popcorn flick. But because Spielberg has a heart (and a brain), and because Tom Cruise was willing to play this type of character, they helped me work through my emotions about a real life act of horror, unplugging a stoppage and letting emotions flow. This may be an indictment of me, or our media-based society, but I’m just glad it happened. Film is a powerful medium, and when it’s used in the right way, for “moral” purposes, it can be a potent force for good. The original artwork for my collaborative piece, “Cartoon Physics, Part One,” (from a poem by Nick Flynn), is currently on view, as part of the exhibition, “Comic Release: Negotiating Identity for a New Generation” (curated by Vicky A. Clark and Barbara Bloemink with Ana Merino and Rick Gribenas), at the Regina Gouger Miller Gallery, in the Purnell Center of the Arts at Carnegie Mellon University. The show will be up until March 21, before it moves on to the New Orleans Contemporary Arts Center, the University of North Texas, and Western Washington University. All this after the piece was exhibited in Athens, Greece, as part of the 2002 International Comics Festival! I recently donated my three-page story, “Song for September 11th,” to the Prints and Photographs Division of The Library of Congress. Martha Kennedy, Curator of the Swann Collection of Caricature and Cartoon, asked me to contribute my original pages to the collection. Ms. Kennedy wrote me about the piece: “The quality of the drawing and text was very high. The juxtaposition of song lyrics, narrative and image was effective.” How could I resist? I’m very honored to have my work be a permanent part of this national collection. You can see my 9-11 submission — and a short interview with me — at the Comic Book Resource website. Check it out!